At 4:32 pm Thursday, Liberal firefighters were called to 406 N. Prospect for a possible structure fire. 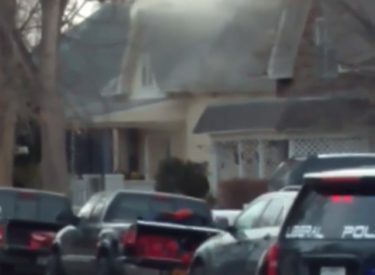 Initial reports indicated that heavy smoke was seen coming from the roof of the residence, and fire personnel responding noted smoke in the area several blocks away from the address. First arriving fire personnel reported a “working” structure fire with unknown occupants, heavy smoke from the roof and fire visible on the North side eaves. Shortly after fire department arrival, personnel of the Liberal / Seward County Emergency Communications Center advised they were in phone contact with a person inside the residence who was attempting to evacuate. One male occupant was able to leave the residence with no injury. The fire was determined to be located on the second floor and firefighters were able to reach the top of the stairs, where they encountered dense smoke, but no fire. Using thermal imaging cameras they reported readings of nearly 1200 degrees at ceiling level. Firefighters began opening ceilings and walls to locate the fire, however the fire quickly burned through the roof and the building suffered a partial collapse. At this point all fire personnel were withdrawn from the building and a defensive attack was initiated in an attempt to control the fire. It was quickly evident that the fire had burned for some time and had spread throughout the entire attic area outside the walls of the upstairs rooms. The attic was further compartmented making it difficult to access the fire from any one vantage point. Firefighters were hampered by several areas of weakened roof and partially collapsed areas. They also battled below freezing temperatures that led to icing and extremely slick conditions on roof areas and ladders. The fire was finally declared under control at 7:39 pm. The Liberal Fire Department responded with a total of 21 personnel. Also assisting at the scene were Liberal Police Department & Water Department, Seward County EMS, Southern Pioneer Electric, Black Hills Energy and American Red Cross. No injuries were reported. All units were fully returned to service at 11:00 pm.